Simon & Schuster Books for Young Readers, 9781481430951, 40pp. 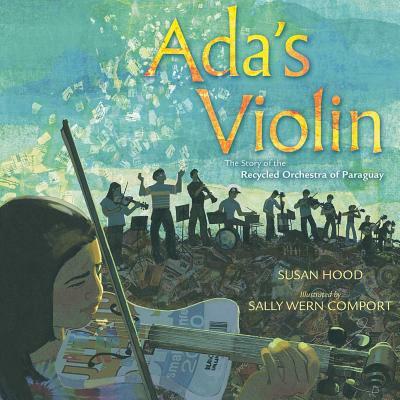 "The mixed-media collages are a particular effective medium for this true story, layering images of Ada and the orchestra over the landfill. The nuances of the subject may strike a stronger chord with adults rather than children, but the interesting visuals and the underlying message of hope and perseverance should help this find an audience." "Comport's complex, digitally enhanced collages combine acrylics, drawing, and layered typographic elements, conveying both the oppressive omnipresence of garbage and the functional beauty of the handcrafted instruments. . . . Pair with the suggested video links to experience the music of a remarkable, resilient cultural community. " "The illustrations, compilations of torn paper, paint, and pen and ink illustrations, add to the feeling of being within the landfill, and are a beautiful representation of the location...Highly Recommended."